This article is about the hormone and neurotransmitter. For the medication used in treating low blood pressure, see norepinephrine (medication). Norepinephrine (NE), also called noradrenaline (NA) or noradrenalin, is an organic chemical in the catecholamine family that functions in the brain and body as a hormone and neurotransmitter. The name “noradrenaline”, derived from Latin roots meaning “at/alongside the kidneys”, is more commonly used in the United Kingdom; in the United States, “norepinephrine”, derived from Greek roots having that same meaning, is usually preferred. “Norepinephrine” is also the international nonproprietary name given to the drug. Regardless of which name is used for the substance itself, parts of the body that produce or are affected by it are referred to as noradrenergic. The general function of norepinephrine is to mobilize the brain and body for action. Norepinephrine release is lowest during sleep, rises during wakefulness, and reaches much higher levels during situations of stress or danger, in the so-called fight-or-flight response. In the brain, norepinephrine increases arousal and alertness, promotes vigilance, enhances formation and retrieval of memory, and focuses attention; it also increases restlessness and anxiety. In the rest of the body, norepinephrine increases heart rate and blood pressure, triggers the release of glucose from energy stores, increases blood flow to skeletal muscle, reduces blood flow to the gastrointestinal system, and inhibits voiding of the bladder and gastrointestinal motility. In the brain, noradrenaline is produced in nuclei that are small yet exert powerful effects on other brain areas. The most important of these nuclei is the locus coeruleus, located in the pons. Outside the brain, norepinephrine is used as a neurotransmitter by sympathetic ganglia located near the spinal cord or in the abdomen, and it is also released directly into the bloodstream by the adrenal glands. Regardless of how and where it is released, norepinephrine acts on target cells by binding to and activating noradrenergic receptors located on the cell surface. A variety of medically important drugs work by altering the actions of noradrenaline systems. Noradrenaline itself is widely used as an injectable drug for the treatment of critically low blood pressure. Beta blockers, which counter some of the effects of noradrenaline, are frequently used to treat glaucoma, migraine, and a range of cardiovascular problems. Alpha blockers, which counter a different set of noradrenaline effects, are used to treat several cardiovascular and psychiatric conditions. Alpha-2 agonists often have a sedating effect, and are commonly used as anesthesia-enhancers in surgery, as well as in treatment of drug or alcohol dependence. Many important psychiatric drugs exert strong effects on noradrenaline systems in the brain, resulting in side-effects that may be helpful or harmful. Norepinephrine is a catecholamine and a phenethylamine. Its structure differs from that of epinephrine only in that epinephrine has a methyl group attached to its nitrogen, whereas the methyl group is replaced by a hydrogen atom in norepinephrine. The prefix nor- is derived as an abbreviation of the word “normal”, used to indicate a demethylated compound. Norepinephrine is synthesized from dopamine in the human body by the dopamine β-hydroxylase (DBH) enzyme. Thus the direct precursor of norepinephrine is dopamine, which is synthesized indirectly from the essential amino acid phenylalanine or the non-essential amino acid tyrosine. These amino acids are found in nearly every protein and, as such, are provided by ingestion of protein-containing food, with tyrosine being the most common. Phenylalanine is converted into tyrosine by the enzyme phenylalanine hydroxylase, with molecular oxygen (O2) and tetrahydrobiopterin as cofactors. Tyrosine is converted into L-DOPA by the enzyme tyrosine hydroxylase, with tetrahydrobiopterin, O2, and probably ferrous iron (Fe2+) as cofactors. L-DOPA is converted into dopamine by the enzyme aromatic L-amino acid decarboxylase (also known as DOPA decarboxylase), with pyridoxal phosphate as a cofactor. Dopamine is then converted into norepinephrine by the enzyme dopamine β-monooxygenase (formerly known as dopamine β-hydroxylase), with O2 and ascorbic acid as cofactors. Norepinephrine itself can further be converted into epinephrine by the enzyme phenylethanolamine N-methyltransferase with S-adenosyl-L-methionine as cofactor. In mammals, norepinephrine is rapidly degraded to various metabolites. The initial step in the breakdown can be catalyzed by either of the enzymes monoamine oxidase (mainly monoamine oxidase A) or COMT. From there the breakdown can proceed by a variety of pathways. The principal end products are either Vanillylmandelic acid or a conjugated form of MHPG, both of which are thought to be biologically inactive and are excreted in the urine. Norepinephrine degradation. 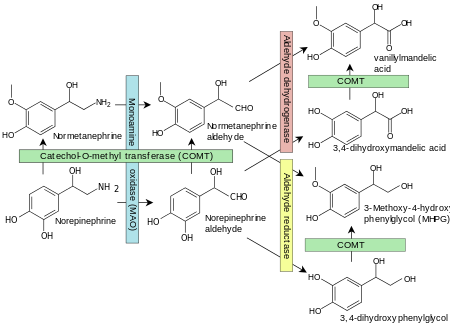 Metabolizing enzymes are shown in boxes. Like many other biologically active substances, norepinephrine exerts its effects by binding to and activating receptors located on the surface of cells. Two broad families of norepinephrine receptors have been identified, known as alpha and beta adrenergic receptors. Alpha receptors are divided into subtypes α1 and α2; beta receptors into subtypes β1, β2, and β3. All of these function as G protein-coupled receptors, meaning that they exert their effects via a complex second messenger system. Alpha-2 receptors usually have inhibitory effects, but many are located pre-synaptically (i.e., on the surface of the cells that release norepinephrine), so the net effect of alpha-2 activation is often a decrease in the amount of norepinephrine released. Alpha-1 receptors and all three types of beta receptors usually have excitatory effects. Norepinephrine (labeled “noradrenaline” in this drawing) processing in a synapse. After release norepinephrine can either be taken up again by the presynaptic terminal, or broken down by enzymes. 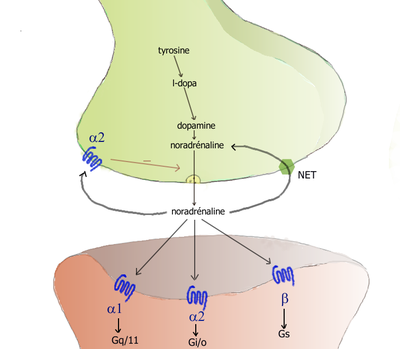 Inside the brain norepinephrine functions as a neurotransmitter, and is controlled by a set of mechanisms common to all monoamine neurotransmitters. After synthesis, norepinephrine is transported from the cytosol into synaptic vesicles by the vesicular monoamine transporter (VMAT). Norepinephrine is stored in these vesicles until it is ejected into the synaptic cleft, typically after an action potential causes the vesicles to release their contents directly into the synaptic cleft through a process called exocytosis. Once in the synapse, norepinephrine binds to and activates receptors. After an action potential, the norepinephrine molecules quickly become unbound from their receptors. They are then absorbed back into the presynaptic cell, via reuptake mediated primarily by the norepinephrine transporter (NET). Once back in the cytosol, norepinephrine can either be broken down by monoamine oxidase or repackaged into vesicles by VMAT, making it available for future release. Schema of the sympathetic nervous system, showing the sympathetic ganglia and the parts of the body to which they connect. Norepinephrine is the main neurotransmitter used by the sympathetic nervous system, which consists of about two dozen sympathetic chain ganglia located next to the spinal cord, plus a set of prevertebral ganglia located in the chest and abdomen. These sympathetic ganglia are connected to numerous organs, including the eyes, salivary glands, heart, lungs, liver, gallbladder, stomach, intestines, kidneys, urinary bladder, reproductive organs, muscles, skin, and adrenal glands. Sympathetic activation of the adrenal glands causes the part called the adrenal medulla to release norepinephrine (as well as epinephrine) into the bloodstream, from which, functioning as a hormone, it gains further access to a wide variety of tissues. Broadly speaking, the effect of norepinephrine on each target organ is to modify its state in a way that makes it more conducive to active body movement, often at a cost of increased energy use and increased wear and tear. This can be contrasted with the acetylcholine-mediated effects of the parasympathetic nervous system, which modifies most of the same organs into a state more conducive to rest, recovery, and digestion of food, and usually less costly in terms of energy expenditure. In the eyes, an increase in production of tears, making the eyes more moist, and pupil dilation through contraction of the iris dilator. In the heart, an increase in the amount of blood pumped. In brown adipose tissue, an increase in calories burned to generate body heat. Multiple effects on the immune system. The sympathetic nervous system is the primary path of interaction between the immune system and the brain, and several components receive sympathetic inputs, including the thymus, spleen, and lymph nodes. However the effects are complex, with some immune processes activated while others are inhibited. In the arteries, constriction of blood vessels, causing an increase in blood pressure. In the kidneys, release of renin and retention of sodium in the bloodstream. In the liver, an increase in production of glucose, either by glycogenolysis after a meal or by gluconeogenesis when food has not recently been consumed. Glucose is the body’s main energy source in most conditions. In the stomach and intestines, a reduction in digestive activity. This results from a generally inhibitory effect of norepinephrine on the enteric nervous system, causing decreases in gastrointestinal mobility, blood flow, and secretion of digestive substances. The noradrenergic neurons in the brain form a neurotransmitter system, that, when activated, exerts effects on large areas of the brain. The effects are manifested in alertness, arousal, and readiness for action. Noradrenergic neurons (i.e., neurons whose primary neurotransmitter is norepinephrine) are comparatively few in number, and their cell bodies are confined to a few relatively small brain areas, but they send projections to many other brain areas and exert powerful effects on their targets. These noradrenergic cell groups were first mapped in 1964 by Annica Dahlström and Kjell Fuxe, who assigned them labels starting with the letter “A” (for “aminergic”). In their scheme, areas A1 through A7 contain the neurotransmitter norepinephrine (A8 through A14 contain dopamine). Noradrenergic cell group A1 is located in the caudal ventrolateral part of the medulla, and plays a role in the control of body fluid metabolism. 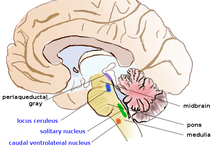 Noradrenergic cell group A2 is located in a brainstem area called the solitary nucleus; these cells have been implicated in a variety of responses, including control of food intake and responses to stress. Cell groups A5 and A7 project mainly to the spinal cord. The most important source of norepinephrine in the brain is the locus coeruleus, which contains noradrenergic cell group A6 and adjoins cell group A4. The locus coeruleus is quite small in absolute terms—in primates it is estimated to contain around 15,000 neurons, less than one millionth of the neurons in the brain—but it sends projections to every major part of the brain and also to the spinal cord. The level of activity in the locus coeruleus correlates broadly with vigilance and speed of reaction. LC activity is low during sleep and drops to virtually nothing during the REM (dreaming) state. It runs at a baseline level during wakefulness, but increases temporarily when a person is presented with any sort of stimulus that draws attention. Unpleasant stimuli such as pain, difficulty breathing, bladder distension, heat or cold generate larger increases. Extremely unpleasant states such as intense fear or intense pain are associated with very high levels of LC activity. Norepinephrine released by the locus coeruleus affects brain function in a number of ways. It enhances processing of sensory inputs, enhances attention, enhances formation and retrieval of both long term and working memory, and enhances the ability of the brain to respond to inputs by changing the activity pattern in the prefrontal cortex and other areas. The control of arousal level is strong enough that drug-induced suppression of the LC has a powerful sedating effect. There is great similarity between situations that activate the locus coeruleus in the brain and situations that activate the sympathetic nervous system in the periphery: the LC essentially mobilizes the brain for action while the sympathetic system mobilizes the body. It has been argued that this similarity arises because both are to a large degree controlled by the same brain structures, particularly a part of the brainstem called the nucleus gigantocellularis. A large number of important drugs exert their effects by interacting with norepinephrine systems in the brain or body. Their uses include treatment of cardiovascular problems, shock, and a variety of psychiatric conditions. These drugs are divided into: sympathomimetic drugs which mimic or enhance at least some of the effects of norepinephrine released by the sympathetic nervous system; sympatholytic drugs, in contrast, block at least some of the effects. Both of these are large groups with diverse uses, depending on exactly which effects are enhanced or blocked. Norepinephrine itself is classified as a sympathomimetic drug: its effects when given by intravenous injection of increasing heart rate and force and constricting blood vessels make it very useful for treating medical emergencies that involve critically low blood pressure. Surviving Sepsis Campaign recommended norepinephrine as first line agent in treating septic shock which is unresponsive to fluid resuscitation, supplemented by vasopressin and epinephrine. Dopamine usage is restricted only to highly selected patients. These are sympatholytic drugs that block the effects of beta adrenergic receptors while having little or no effect on alpha receptors. They are sometimes used to treat high blood pressure, atrial fibrillation and congestive heart failure, but recent reviews have concluded that other types of drugs are usually superior for those purposes. Beta blockers may be a viable choice for other cardiovascular conditions, though, including angina and Marfan syndrome. They are also widely used to treat glaucoma, most commonly in the form of eyedrops. Because of their effects in reducing anxiety symptoms and tremor, they have sometimes been used by entertainers, public speakers and athletes to reduce performance anxiety, although they are not medically approved for that purpose and are banned by the International Olympic Committee. However, the usefulness of beta blockers is limited by a range of serious side effects, including slowing of heart rate, a drop in blood pressure, asthma, and reactive hypoglycemia. The negative effects can be particularly severe in people who suffer from diabetes. These are sympatholytic drugs that block the effects of adrenergic alpha receptors while having little or no effect on beta receptors. Drugs belonging to this group can have very different effects, however, depending on whether they primarily block alpha-1 receptors, alpha-2 receptors, or both. Alpha-2 receptors, as described elsewhere in this article, are frequently located on norepinephrine-releasing neurons themselves and have inhibitory effects on them; consequently blockage of alpha-2 receptors usually results in an increase in norepinephrine release. Alpha-1 receptors are usually located on target cells and have excitatory effects on them; consequently blockage of alpha-1 receptors usually results in blocking some of the effects of norepinephrine. Drugs such as phentolamine that act on both types of receptors can produce a complex combination of both effects. In most cases when the term “alpha blocker” is used without qualification, it refers to a selective alpha-1 antagonist. Selective alpha-1 blockers have a variety of uses. Because one of their effects is to relax the muscles in the neck of the bladder, they are often used to treat benign prostatic hyperplasia, and to help with the expulsion of bladder stones. Alpha-blockers also likely help people pass their kidney stones. Their effects on the central nervous system make them useful for treating generalized anxiety disorder, panic disorder, and posttraumatic stress disorder. They may, however, have significant side-effects, including a drop in blood pressure. Some antidepressants function partly as selective alpha-2 blockers, but the best-known drug in that class is yohimbine, which is extracted from the bark of the African yohimbe tree. Yohimbine acts as a male potency enhancer, but its usefulness for that purpose is limited by serious side-effects including anxiety and insomnia. Overdoses can cause a dangerous increase in blood pressure. Yohimbine is banned in many countries, but in the United States, because it is extracted from a plant rather than chemically synthesized, it is sold over the counter as a nutritional supplement. These are sympathomimetic drugs that activate alpha-2 receptors or enhance their effects. Because alpha-2 receptors are inhibitory and many are located presynaptically on norepinephrine-releasing cells, the net effect of these drugs is usually to reduce the amount of norepinephrine released. Drugs in this group that are capable of entering the brain often have strong sedating effects, due to their inhibitory effects on the locus coeruleus. Clonidine, for example, is used for the treatment of anxiety disorders and insomnia, and also as a sedative premedication for patients about to undergo surgery. Xylazine, another drug in this group, is also a powerful sedative and is often used in combination with ketamine as a general anaesthetic for veterinary surgery—in the United States it has not been approved for use in humans. These are drugs whose primary effects are thought to be mediated by different neurotransmitter systems (dopamine for stimulants, serotonin for antidepressants), but many also increase levels of norepinephrine in the brain. Amphetamine, for example, is a stimulant that increases release of norepinephrine as well as dopamine. Monoamine oxidase inhibitors are antidepressants that inhibit the metabolic degradation of norepinephrine as well as serotonin. In some cases it is difficult to distinguish the norepinephrine-mediated effects from the effects related to other neurotransmitters. Hyperactivation of the sympathetic nervous system is not a recognized condition in itself, but it is a component of a number of conditions, as well as a possible consequence of taking sympathomimetic drugs. It causes a distinctive set of symptoms including aches and pains, rapid heartbeat, elevated blood pressure, sweating, palpitations, anxiety, headache, paleness, and a drop in blood glucose. If sympathetic activity is elevated for an extended time, it can cause weight loss and other stress-related body changes. The list of conditions that can cause sympathetic hyperactivation includes severe brain injury, spinal cord damage, heart failure, high blood pressure, kidney disease, and various types of stress. Stress, to a physiologist, means any situation that threatens the continued stability of the body and its functions. Stress affects a wide variety of body systems: the two most consistently activated are the hypothalamic-pituitary-adrenal axis and the norepinephrine system, including both the sympathetic nervous system and the locus coeruleus-centered system in the brain. Stressors of many types evoke increases in noradrenergic activity, which mobilizes the brain and body to meet the threat. Chronic stress, if continued for a long time, can damage many parts of the body. A significant part of the damage is due to the effects of sustained norepinephrine release, because of norepinephrine’s general function of directing resources away from maintenance, regeneration, and reproduction, and toward systems that are required for active movement. The consequences can include slowing of growth (in children), sleeplessness, loss of libido, gastrointestinal problems, impaired disease resistance, slower rates of injury healing, depression, and increased vulnerability to addiction. Attention deficit hyperactivity disorder is a psychiatric condition involving problems with attention, hyperactivity, and impulsiveness. It is most commonly treated using stimulant drugs such as methylphenidate (Ritalin), whose primary effect is to increase dopamine levels in the brain, but drugs in this group also generally increase brain levels of norepinephrine, and it has been difficult to determine whether these actions are involved in their clinical value. Also there is substantial evidence that many people with ADHD show “biomarkers” involving altered norepinephrine processing. Several drugs whose primary effects are on norepinephrine, including guanfacine, clonidine, and atomoxetine, have been tried as treatments for ADHD, and found to have effects comparable to those of stimulants. Several conditions, including Parkinson’s disease, diabetes and so-called pure autonomic failure, can cause a loss of norepinephrine-secreting neurons in the sympathetic nervous system. The symptoms are widespread, the most serious being a reduction in heart rate and an extreme drop in resting blood pressure, making it impossible for severely affected people to stand for more than a few seconds without fainting. Treatment can involve dietary changes or drugs. Norepinephrine has been reported to exist in a wide variety of animal species, including protozoa, placozoa and cnidaria (jellyfish and related species), but not in ctenophores (comb jellies), whose nervous systems differ greatly from those of other animals. It is generally present in deuterostomes (vertebrates, etc. ), but in protostomes (arthropods, molluscs, flatworms, nematodes, annelids, etc.) it is replaced by octopamine, a closely related chemical with a closely related synthesis pathway. In insects, octopamine has alerting and activating functions that correspond (at least roughly) with the functions of norepinephrine in vertebrates. It has been argued that octopamine evolved to replace norepinephrine rather than vice versa; however, the nervous system of amphioxus (a primitive chordate) has been reported to contain octopamine but not norepinephrine, which presents difficulties for that hypothesis. Early in the twentieth century Walter Cannon, who had popularized the idea of a sympathoadrenal system preparing the body for fight and flight, and his colleague Arturo Rosenblueth developed a theory of two sympathins, sympathin E (excitatory) and sympathin I (inhibitory), responsible for these actions. The Belgian pharmacologist Zénon Bacq as well as Canadian and US-American pharmacologists between 1934 and 1938 suggested that noradrenaline might be a sympathetic transmitter. In 1939, Hermann Blaschko and Peter Holtz independently identified the biosynthetic mechanism for norepinephrine in the vertebrate body. In 1945 Ulf von Euler published the first of a series of papers that established the role of norepinephrine as a neurotransmitter. He demonstrated the presence of norepinephrine in sympathetically innervated tissues and brain, and adduced evidence that it is the sympathin of Cannon and Rosenblueth. ^ Aronson JK (February 2000). “‘Where name and image meet’—the argument for ‘adrenaline‘“. British Medical Journal. 320 (7233): 506–9. doi:10.1136/bmj.320.7233.506. PMC 1127537. PMID 10678871. ^ “(-)-noradrenaline”. IUPHAR database. International Union of Basic and Clinical Pharmacology. Retrieved 2 January 2016. ^ a b “Norepinephrine”. PubChem. Retrieved 6 November 2015. ^ Gaddum JH (June 1956). “The Prefix ‘Nor’ in Chemical Nomenclature”. Nature. 177 (1046): 1046. Bibcode:1956Natur.177.1046G. doi:10.1038/1771046b0. ^ a b c d e f g Musacchio JM (2013). “Chapter 1: Enzymes involved in the biosynthesis and degradation of catecholamines”. In Iverson L (ed.). Biochemistry of Biogenic Amines. Springer. pp. 1–35. ISBN 978-1-4684-3171-1. ^ Griffith RK (2013). “Chapter 10: Adrenergic Receptors and Drugs Affecting Adrenergic Neurotransmission”. In Lemke TL, Williams DA, Zito SW, Roche VF (eds.). Foye’s Principles of Medicinal Chemistry (7th ed.). Philadelphia: Wolters Kluwer Health/Lippincott Williams & Wilkins. p. 343. ISBN 978-1-60913-345-0. ^ a b c d e f g h i Rang HP, Ritter JM, Flower R, Henderson G (2014). “Chapter 14: Noradrenergic transmission”. Rang & Dale’s Pharmacology. Elsevier Health Sciences. pp. 177–196. ISBN 978-0-7020-5497-6. ^ a b Eiden LE, Schäfer MK, Weihe E, Schütz B (2004). “The vesicular amine transporter family (SLC18): amine/proton antiporters required for vesicular accumulation and regulated exocytotic secretion of monoamines and acetylcholine”. Pflügers Arch. 447 (5): 636–40. doi:10.1007/s00424-003-1100-5. PMID 12827358. ^ Torres GE, Gainetdinov RR, Caron MG (2003). “Plasma membrane monoamine transporters: structure, regulation and function”. Nature Reviews Neuroscience. 4 (1): 13–25. doi:10.1038/nrn1008. PMID 12511858. ^ Dartt DA (May 2009). “Neural regulation of lacrimal gland secretory processes: relevance in dry eye diseases”. Progress in Retinal and Eye Research. 28 (3): 155–77. doi:10.1016/j.preteyeres.2009.04.003. PMC 3652637. PMID 19376264. ^ Tank AW, Lee Wong D (January 2015). Peripheral and central effects of circulating catecholamines. Comprehensive Physiology. 5. pp. 1–15. doi:10.1002/cphy.c140007. ISBN 9780470650714. PMID 25589262. ^ Bahler L, Molenaars RJ, Verberne HJ, Holleman F (September 2015). “Role of the autonomic nervous system in activation of human brown adipose tissue: A review of the literature”. Diabetes & Metabolism. 41 (6): 437–445. doi:10.1016/j.diabet.2015.08.005. PMID 26404650. ^ Kenney MJ, Ganta CK (July 2014). 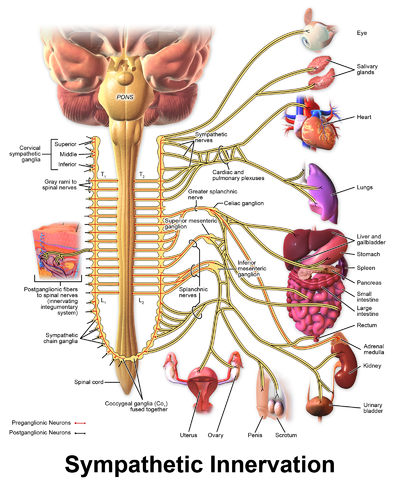 Autonomic nervous system and immune system interactions. Comprehensive Physiology. 4. pp. 1177–200. doi:10.1002/cphy.c130051. ISBN 9780470650714. PMC 4374437. PMID 24944034. ^ Chistiakov DA, Ashwell KW, Orekhov AN, Bobryshev YV (2015). “Innervation of the arterial wall and its modification in atherosclerosis”. Auton Neurosci. 193: 7–11. doi:10.1016/j.autneu.2015.06.005. PMID 26164815. ^ a b c d e Thorp AA, Schlaich MP (2015). “Relevance of Sympathetic Nervous System Activation in Obesity and Metabolic Syndrome”. J Diabetes Res. 2015: 1–11. doi:10.1155/2015/341583. PMC 4430650. PMID 26064978. ^ Konturek SJ, Konturek JW, Pawlik T, Brzozowski T (2004). “Brain-gut axis and its role in the control of food intake” (PDF). J. Physiol. Pharmacol. 55 (1 Pt 2): 137–54. PMID 15082874. ^ Dahlstroem A, Fuxe K (1964). “Evidence for the existence of monoamine-containing neurons in the central nervous system. I. Demonstration of monoamines in the cell bodies of brain stem neurons”. Acta Physiologica Scandinavica. Supplementum. 232 (Supplement 232): 1–55. PMID 14229500. ^ Antunes-Rodrigues J, de Castro M, Elias LL, Valença MM, McCann SM (January 2004). “Neuroendocrine control of body fluid metabolism”. Physiological Reviews. 84 (1): 169–208. doi:10.1152/physrev.00017.2003. PMID 14715914. ^ Rinaman L (February 2011). “Hindbrain noradrenergic A2 neurons: diverse roles in autonomic, endocrine, cognitive, and behavioral functions”. American Journal of Physiology. Regulatory, Integrative and Comparative Physiology. 300 (2): R222–35. doi:10.1152/ajpregu.00556.2010. PMC 3043801. PMID 20962208. ^ Bruinstroop E, Cano G, Vanderhorst VG, Cavalcante JC, Wirth J, Sena-Esteves M, Saper CB (June 2012). “Spinal projections of the A5, A6 (locus coeruleus), and A7 noradrenergic cell groups in rats”. The Journal of Comparative Neurology. 520 (9): 1985–2001. doi:10.1002/cne.23024. PMC 3508755. PMID 22173709. ^ a b c Sara SJ, Bouret S (2012). “Orienting and reorienting: the locus coeruleus mediates cognition through arousal”. Neuron. 76 (1): 130–41. doi:10.1016/j.neuron.2012.09.011. PMID 23040811. ^ a b Berridge CW, Schmeichel BE, España RA (2012). “Noradrenergic modulation of wakefulness/arousal”. Sleep Med Rev. 16 (2): 187–97. doi:10.1016/j.smrv.2011.12.003. PMC 3278579. PMID 22296742. ^ Sara SJ (2015). “Locus Coeruleus in time with the making of memories”. Curr. Opin. Neurobiol. 35: 87–94. doi:10.1016/j.conb.2015.07.004. PMID 26241632. ^ a b c Gardenhire DS (2013). Rau’s Respiratory Care Pharmacology. Elsevier Health Sciences. p. 88. ISBN 978-0-323-27714-3. ^ Rhodes, Andrew; Evans, Laura E (March 2017). “Surviving Sepsis Campaign: International Guidelines for Management of Sepsis and Septic Shock 2016”. Critical Care Medicine. 45 (3): 486–552. doi:10.1097/CCM.0000000000002255. PMID 28098591. We recommend norepinephrine as the first-choice vasopressor (strong recommendation, moderate quality of evidence). ^ a b Deedwania PC (2015). “Management of Patients With Stable Angina and Type 2 Diabetes”. Rev Cardiovasc Med. 16 (2): 105–13. PMID 26198557. ^ Mareev Y, Cleland JG (2015). “Should β-Blockers Be Used in Patients With Heart Failure and Atrial Fibrillation?”. Clin Ther. 37 (10): 2215–24. doi:10.1016/j.clinthera.2015.08.017. PMID 26391145. ^ Kumar A, Agarwal S (2014). “Marfan syndrome: An eyesight of syndrome”. Meta Gene. 2: 96–105. doi:10.1016/j.mgene.2013.10.008. PMC 4287801. PMID 25606393. ^ a b Inoue K (2014). “Managing adverse effects of glaucoma medications”. Clin Ophthalmol. 8: 903–13. doi:10.2147/OPTH.S44708. PMC 4025938. PMID 24872675. ^ Brugués AO (2011). “Music performance anxiety-part 2. a review of treatment options”. Med Probl Perform Art. 26 (3): 164–71. PMID 21987072. ^ Fitch K (2012). “Proscribed drugs at the Olympic Games: permitted use and misuse (doping) by athletes”. Clin Med. 12 (3): 257–60. doi:10.7861/clinmedicine.12-3-257. PMC 4953490. PMID 22783779. ^ Campschroer, Thijs; Zhu, Xiaoye; Vernooij, Robin Wm; Lock, Mtw Tycho (5 April 2018). “Alpha-blockers as medical expulsive therapy for ureteral stones”. The Cochrane Database of Systematic Reviews. 4: CD008509. doi:10.1002/14651858.CD008509.pub3. ISSN 1469-493X. PMID 29620795. ^ Green B (2014). “Prazosin in the treatment of PTSD”. J Psychiatr Pract. 20 (4): 253–9. doi:10.1097/01.pra.0000452561.98286.1e. PMID 25036580. ^ a b c Corazza O, Martinotti G, Santacroce R, Chillemi E, Di Giannantonio M, Schifano F, Cellek S (2014). “Sexual enhancement products for sale online: raising awareness of the psychoactive effects of yohimbine, maca, horny goat weed, and Ginkgo biloba”. Biomed Res Int. 2014: 1–13. doi:10.1155/2014/841798. PMC 4082836. PMID 25025070. ^ a b Lemke KA (2004). “Perioperative use of selective alpha-2 agonists and antagonists in small animals”. Can. Vet. J. 45 (6): 475–80. PMC 548630. PMID 15283516. ^ Belkin MR, Schwartz TL (2015). “Alpha-2 receptor agonists for the treatment of posttraumatic stress disorder”. Drugs Context. 4: 1–5. doi:10.7573/dic.212286. PMC 4544272. PMID 26322115. ^ Greene SA, Thurmon JC (1988). “Xylazine—a review of its pharmacology and use in veterinary medicine”. J. Vet. Pharmacol. Ther. 11 (4): 295–313. doi:10.1111/j.1365-2885.1988.tb00189.x. PMID 3062194. ^ Heal, David J.; Smith, Sharon L.; Gosden, Jane; Nutt, David J. (June 2013). “Amphetamine, past and present—a pharmacological and clinical perspective”. Journal of Psychopharmacology. 27 (6): 479–496. doi:10.1177/0269881113482532. PMC 3666194. PMID 23539642. ^ Lump D, Moyer M (2014). “Paroxysmal sympathetic hyperactivity after severe brain injury”. Curr Neurol Neurosci Rep. 14 (11): 494. doi:10.1007/s11910-014-0494-0. PMID 25220846. ^ Amzallag M (1993). “Autonomic hyperreflexia”. Int Anesthesiol Clin. 31 (1): 87–102. doi:10.1097/00004311-199331010-00009. PMID 8440534. ^ McCrink KA, Brill A, Lymperopoulos A (2015). “Adrenal G protein-coupled receptor kinase-2 in regulation of sympathetic nervous system activity in heart failure”. World J Cardiol. 7 (9): 539–43. doi:10.4330/wjc.v7.i9.539. PMC 4577680. PMID 26413230. ^ Malpas SC (2010). “Sympathetic nervous system overactivity and its role in the development of cardiovascular disease”. Physiol. Rev. 90 (2): 513–57. doi:10.1152/physrev.00007.2009. PMID 20393193. ^ Ksiazek A, Załuska W (2008). “Sympathetic overactivity in uremia”. J Ren Nutr. 18 (1): 118–21. doi:10.1053/j.jrn.2007.10.024. PMID 18089457. ^ a b c d Chrousos GP (2009). “Stress and disorders of the stress system”. Nat Rev Endocrinol. 5 (7): 374–81. doi:10.1038/nrendo.2009.106. PMID 19488073. ^ Faraone SV, Bonvicini C, Scassellati C (2014). “Biomarkers in the diagnosis of ADHD–promising directions”. Curr Psychiatry Rep. 16 (11): 497. doi:10.1007/s11920-014-0497-1. PMID 25298126. ^ Bello NT (2015). “Clinical utility of guanfacine extended release in the treatment of ADHD in children and adolescents”. Patient Prefer Adherence. 9: 877–85. doi:10.2147/PPA.S73167. PMC 4494608. PMID 26170637. ^ Clemow DB, Bushe CJ (2015). “Atomoxetine in patients with ADHD: A clinical and pharmacological review of the onset, trajectory, duration of response and implications for patients”. J. Psychopharmacol. (Oxford). 29 (12): 1221–30. doi:10.1177/0269881115602489. PMID 26349559. ^ Shibao C, Okamoto L, Biaggioni I (2012). “Pharmacotherapy of autonomic failure”. Pharmacol. Ther. 134 (3): 279–86. doi:10.1016/j.pharmthera.2011.05.009. PMC 3358114. PMID 21664375. ^ Kass-Simon G, Pierobon P (2007). “Cnidarian chemical neurotransmission, an updated overview”. Comp. Biochem. Physiol., Part a Mol. Integr. Physiol. 146 (1): 9–25. doi:10.1016/j.cbpa.2006.09.008. PMID 17101286. ^ Moroz LL (2015). “Convergent evolution of neural systems in ctenophores”. J. Exp. Biol. 218 (Pt 4): 598–611. doi:10.1242/jeb.110692. PMC 4334147. PMID 25696823. ^ Verlinden H, Vleugels R, Marchal E, Badisco L, Pflüger HJ, Blenau W, Broeck JV (2010). “The role of octopamine in locusts and other arthropods”. J. Insect Physiol. 56 (8): 854–67. doi:10.1016/j.jinsphys.2010.05.018. PMID 20621695. ^ Herman Blaschko (1987). “A half-century of research on catecholamine biosynthesis”. Journal of Applied Cardiology: 171–183. ^ P. Holtz (1939). “Dopadecarboxylase”. Die Naturwissenschaften (in German). 27 (43): 724–725. Bibcode:1939NW…..27..724H. doi:10.1007/bf01494245. ^ von Euler US (1945). “A sympathomimetic pressor substance in animal organ extracts”. Nature. 156 (3949): 18–19. Bibcode:1945Natur.156…18V. doi:10.1038/156018b0.